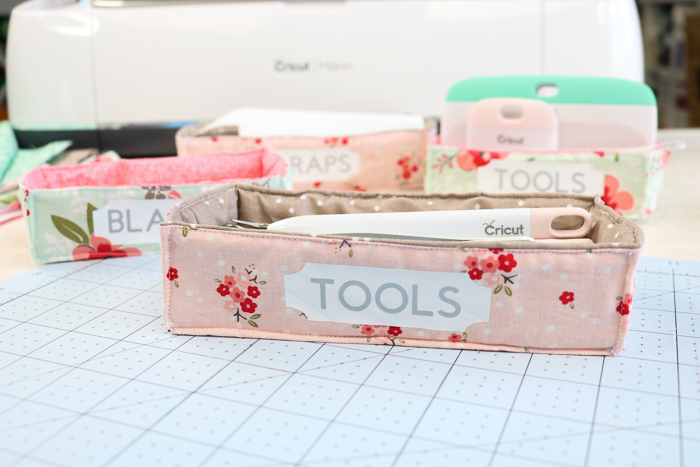 If you have a Cricut, you will love these fabric storage bins for all of those Cricut tools. 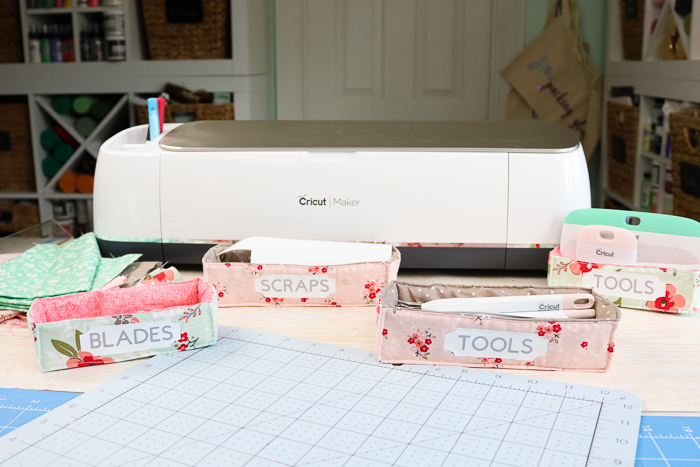 Plus they are easy to make with your Cricut and the rotary blade! 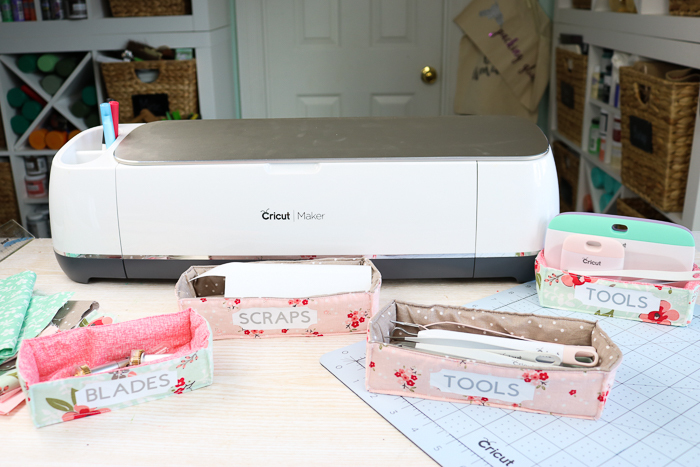 I am showing you how to make your own fabric storage bins using your Cricut Maker and some basic sewing techniques. You can change up the labels on these and use them to organize other areas of your home as well. I could see these fabric baskets in every room storing a variety of household supplies. Some links below may be affiliate links which means that you do not pay anymore, however, a small commission from any purchase will go to this site. I thought a video would be good here to show all of the steps to make these fabric storage bins. You can watch the entire process from start to finish below. 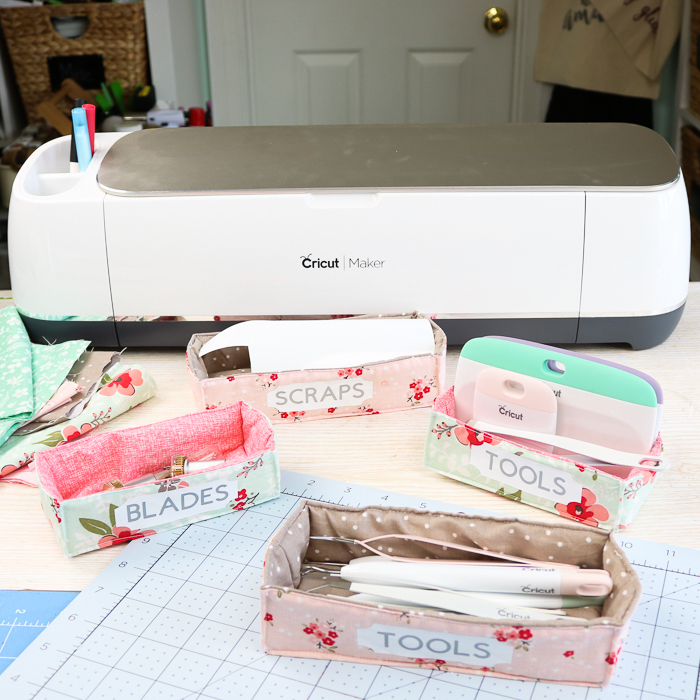 Last week we talked about the rotary blade and how great it is at cutting fabric. 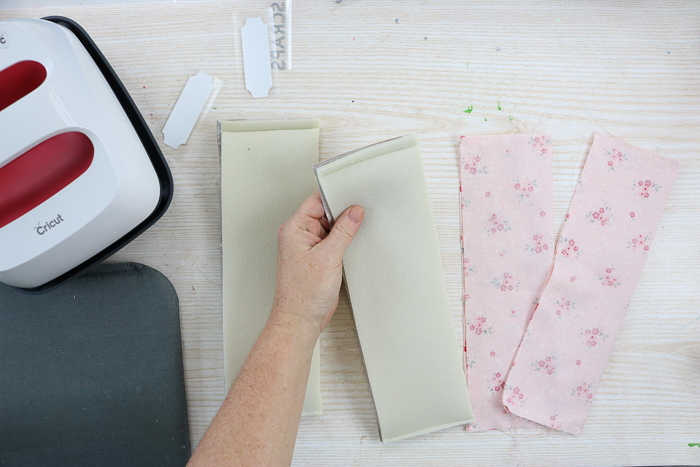 You can actually see 10 different fabrics I cut with it last week by clicking here. 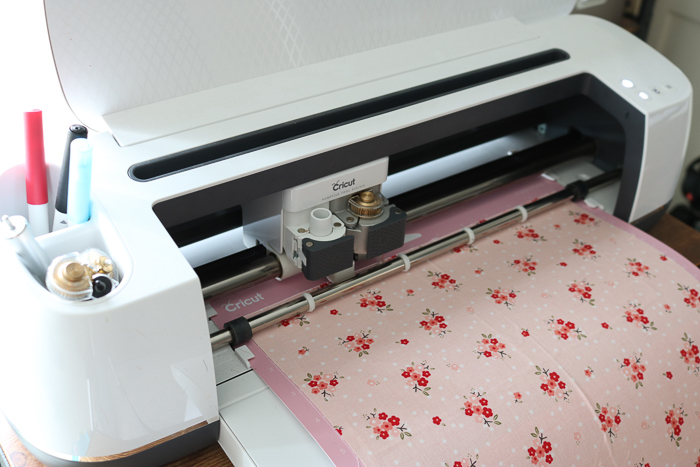 Today I am using it to cut the designer fabric from Cricut and make a project! Want to see even more fabrics it can cut? Try this video! First, you will need to add your fabric right to the pink fabric mat. It doesn’t need a backer or anything added and the Cricut fabric is already cut to 12 inches wide. The 12×24 mat works best with this project but you can use a 12×12. You will just have more scrap with the smaller mat. 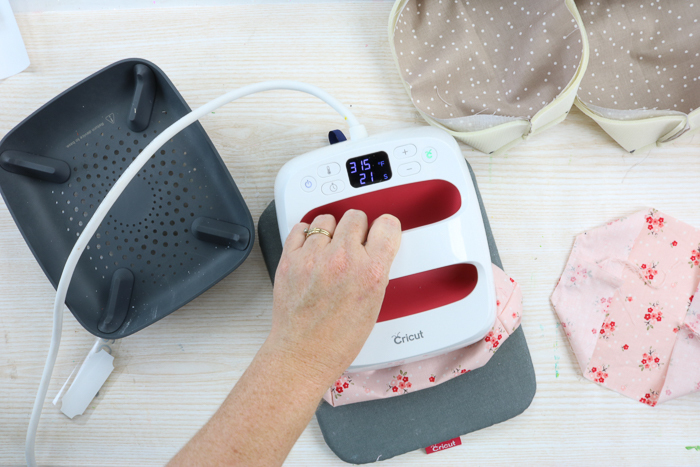 You can also use a brayer on your fabric after attaching it to the fabric mat to make sure it adheres well and to remove any bubbles. 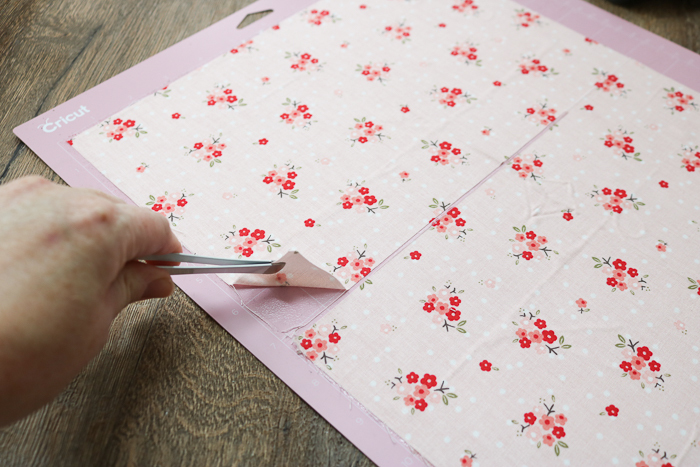 Then cut your pieces from the fabric. The cut file for this project can be found by clicking here. 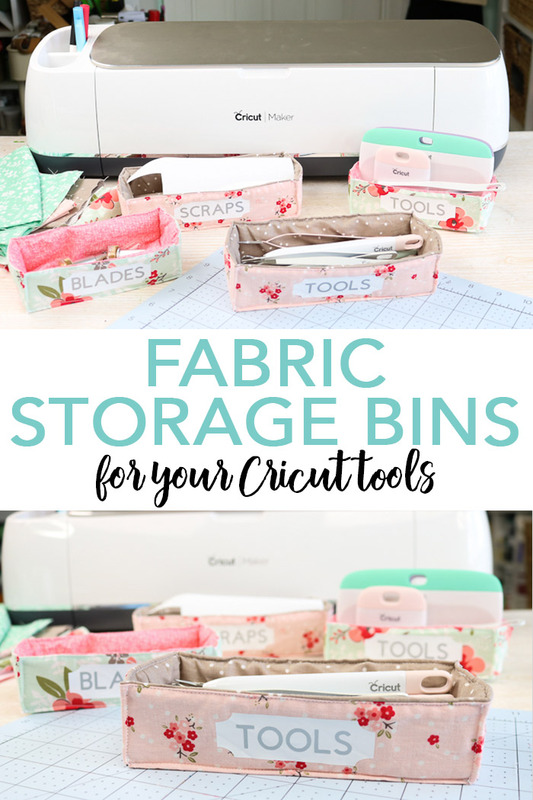 You will also use this same method to cut your batting or stiffener that you use on the inside of your fabric storage bins. 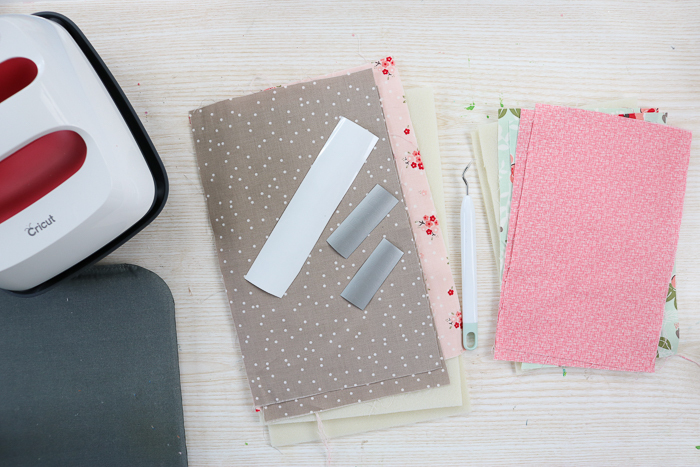 Just be sure to pick the correct fabric type of each mat before you start cutting. 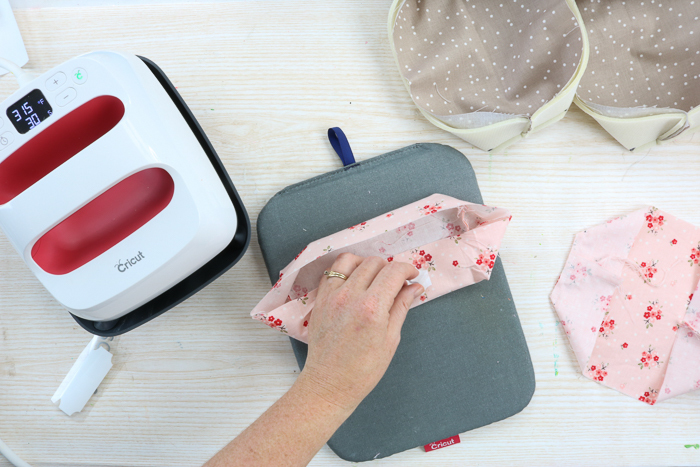 TIP: If you use tweezers to remove the fabric from the fabric mat, you can extend its life. The oils from your fingers can cause the adhesive on this mat to breakdown. You will also need to cut your iron-on. Be sure to turn the mirror on before cutting and cut with the shiny side down on the mat. You will also need to weed your iron-on to remove any excess around the outside as well as the center of letters. Weeding tools make this a bit easier but are optional. 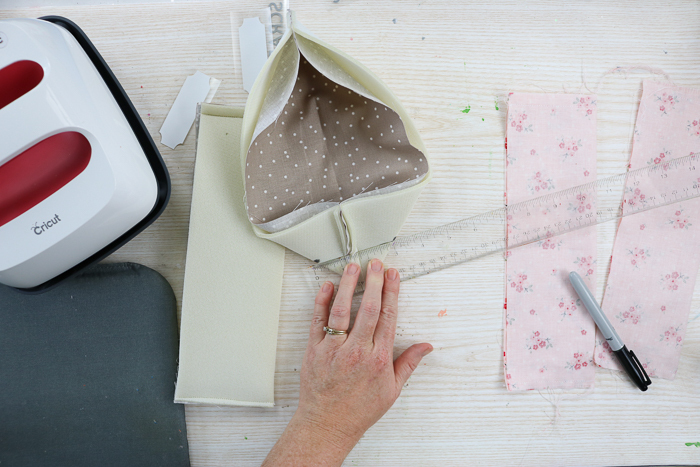 Start by folding the inner liner inside of the batting and sew down both short ends as shown below. The inner liner should be good sides together. Repeat this for the outer pieces as well. The outer pieces will not have any batting. Fold the short ends in as shown below. Then measure and mark each one to the exact same dimension. I used 3 inches on the larger basket and 2 1/2 inches on the smaller one. This dimension determines the width of the bottom of your fabric basket and can be customized for your needs. Sew in between these marks then snip off the excess with your scissors. Repeat for all of your pieces. You can then use the EasyPress to press the outer pieces so you can see where the front will be once sewn. 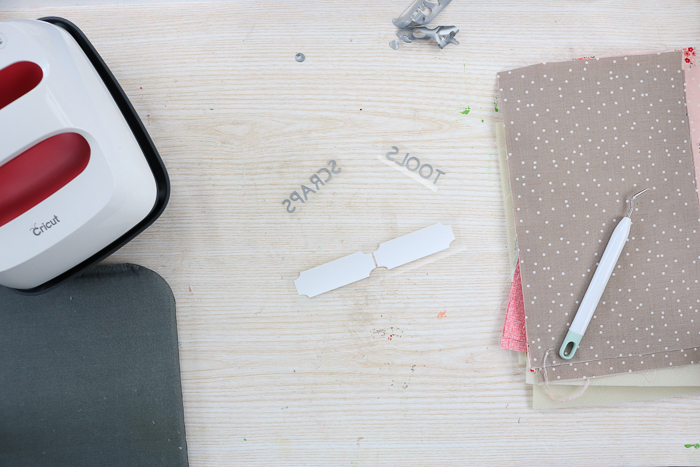 Use these pressed markings to locate your organization tags. Put the first piece of the iron-on in place. 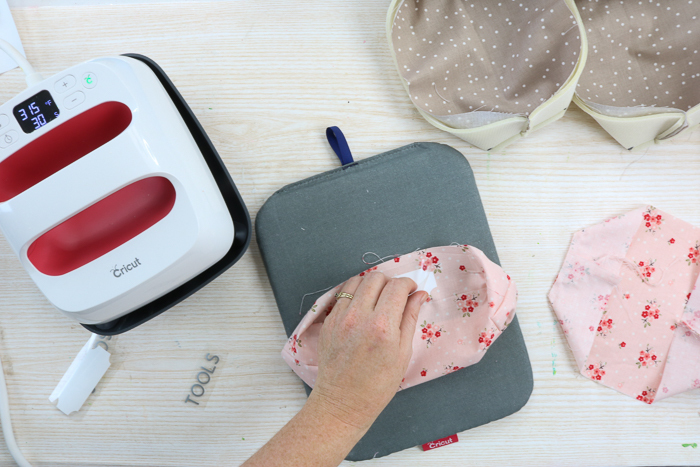 Be sure to take into account that you still have to sew across the top of your basket. 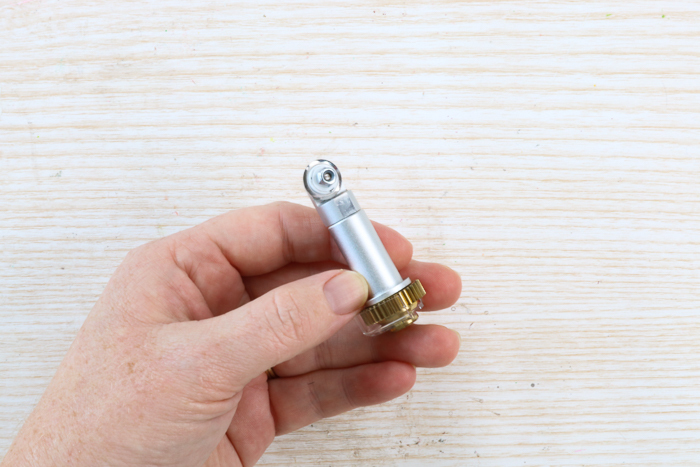 Press the first piece by using the settings found here for your EasyPress. Be sure to look up the type of iron-on you are using as well as your base material. Then peel off the carrier sheet from the first iron-on and add the second right on top. Be sure to use the carrier sheet you removed to cover the entire thing before pressing a second time. 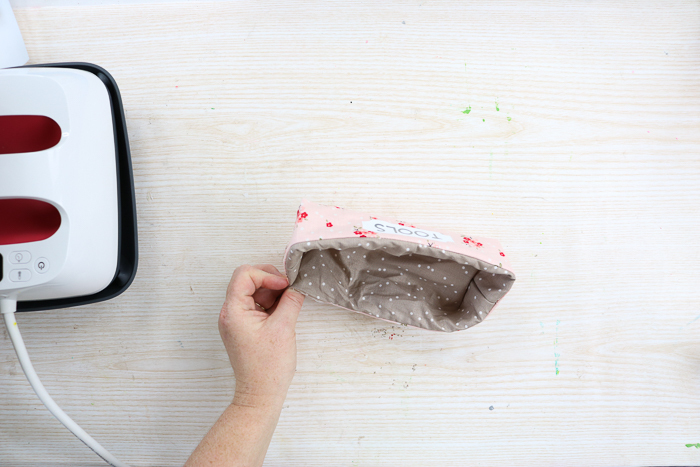 You do not want your EasyPress to touch the iron-on without a protector. Once you press a second time on the front and from the back, you can remove the carrier sheets. Then put the outer piece inside of the inner lining. The fabrics should be with the good sides together. Sew around the top leaving a 3 – 4 inch opening for turning. Use the opening to turn the bin right side out. Now you just need to topstitch to finish the project. Top stitch around the top first making sure to turn your hole in and sew across to close it. You can also top stitch the corners as well as the long edges along the bottom. This will give you a more finished basket. You can see this in the image below. The bin on the left is only topstitched on the top while the one on the right has been topstitched on all four corners as well as the long edges along the bottom. 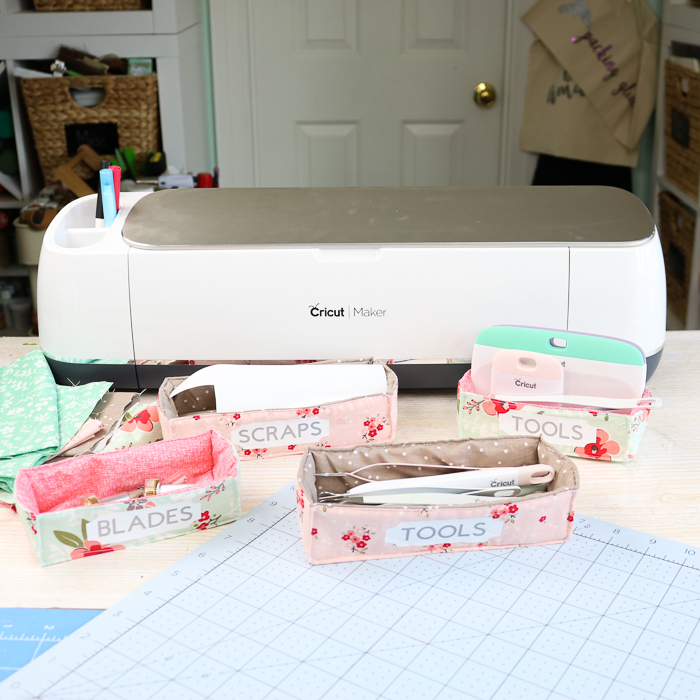 Then just add in your Cricut tools or anything else that you want to organize in your fabric storage bins. I love how the designer fabric from Cricut comes in coordinating colors! You can perfectly match your baskets without even really thinking about it. 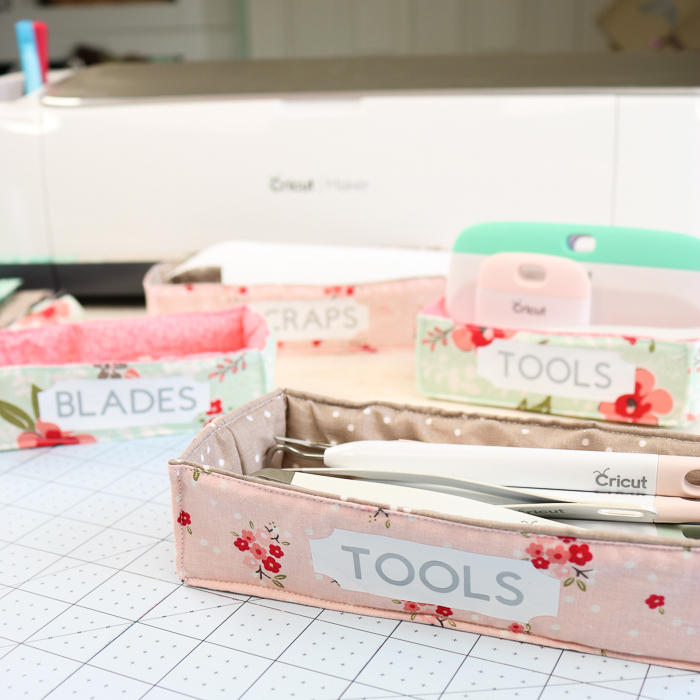 Add these to your craft room to make sure that all of your Cricut tools and other craft supplies stay organized. 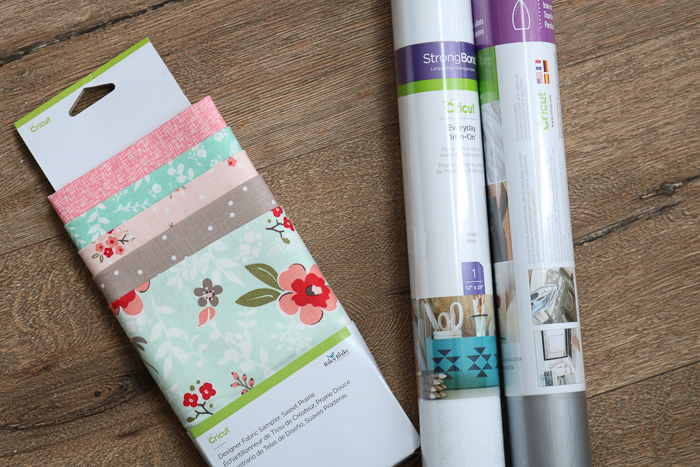 Change up the labels on the front to match whatever you need to store and make these for any room in your home. 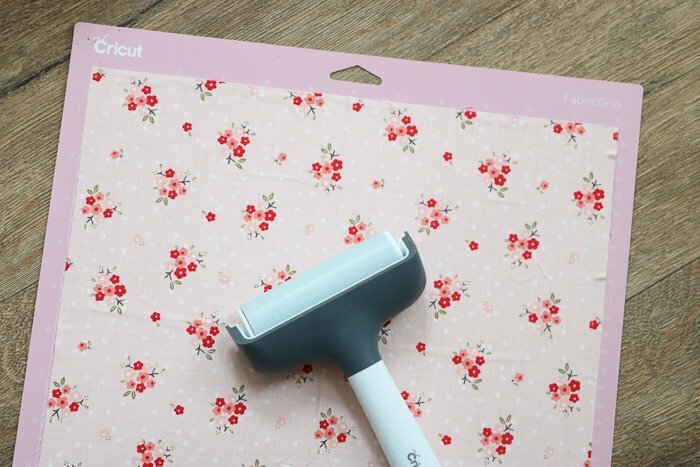 The Cricut Maker makes cutting fabric so easy! It is simple to cut all of the pattern pieces you need for projects like this one. I love the accuracy that I always get when using my Cricut Maker. That means that I don’t have to worry about fabric pieces for projects like these being different. They are all exactly the same when I am layering up for sewing. 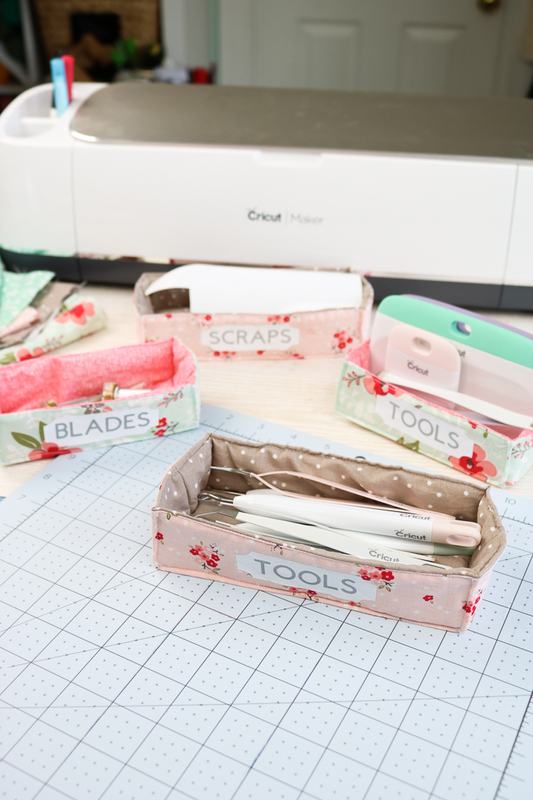 Don’t want to use the Cricut fabric to make these fabric storage bins? No problem! The Maker cuts so many fabrics from the super delicate to heavy weight fabrics like denim and more. 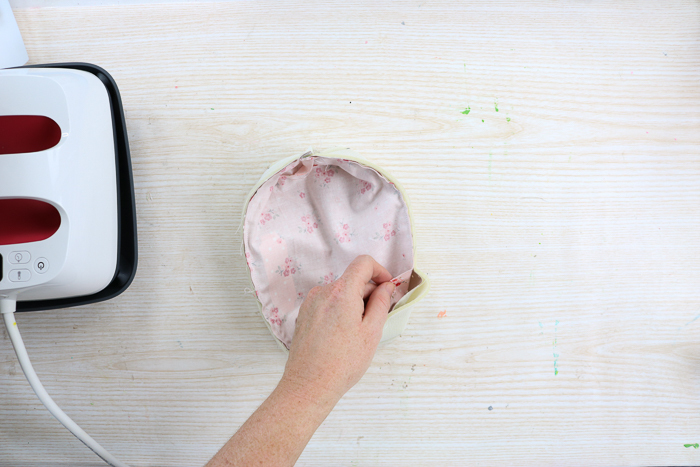 You can really make these bins in any fabric you can imagine! I love these so much!! They are so perfect for storing all the little things that never have a proper home! These are brilliant! My blades are all in a pile—this would help corral them. how cute are these!! love them! !